The Lower Yakima River is Washington’s only blue ribbon trout stream, located in the southern portion of the state. The river flows through several reservoirs at Ellensburg and Cle Elum before ending at Roza Dam. The fishing can be quite good between these reservoirs in the water you would expect to find fish and have a great fishing experience. The most popular stretch of the Yakima is between Easton Dam and Roza Dam located at Ellensburg. There are plenty of insects along the Yakima River, which include Baetis, Caddis, PMD and Skwala. The hatches can be pretty good, so be sure to check the hatch chart below and to check in with the local fly shop to see what works best. The Skwala hatch starts in February and the fishing along the banks can be very productive. The Caddis pick up in April and continue to be around until October. If you plan right and can be there during the Caddis hatch you may hook 15+ fish, maybe even double that. The Bow's seem to gobble these flies up. There are hatches of PMD and Baetis during the summer months. The river is open year round providing different conditions throughout the year. The best dry fishing occurs during the spring hatch, as the fish return to their normal eating habits. But the fishing can be great on this river all year long. When the weather starts to get warmer the tributaries dump into the Yakima River bringing the water levels up. This makes it more difficult to wade the river in most spots. There are usually more boaters during this time than fishermen that wade. The river eventually stabilizes and the fly fishing gets hopping. 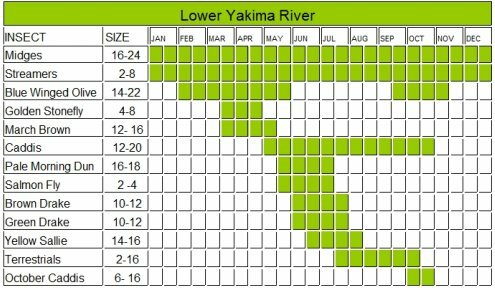 If you had to pick the best time to fish the Yakima River it would be during the fall when the river stabilizes and the fish gorge themselves for the winter. It is no surprise that this river is one of the favorite fly fishing destinations in the state. People come here from all over the region to test their skills on this great river. Map of the Yakima River. Leave the Lower Yakima River area and return to Washington home page.